As shown before, the Yad Vashem database of Holocaust victims contains many double entries as well as entries of survivors. This paper shows that entire sets of victims were entered multiple times, in the present case the 52,000 Jews deported from Berlin. The data contained in the database also reveals that many Jews deported through the infamous Treblinka camp, which is said to have been a wholesale extermination camp with almost no survivors, are reported to have died "downstream" (further east). Hence, for them Treblinka merely served as a transit camp. Jean Marie Boisdefeu, Dubitando. Textes révisionnistes (2004-2008), La Sfinge, Rome 2009, 304 pages. 23,70 €. 51 textes essentiels dont : De Gaulle était-il un révisionniste ? — L’origine du mythe et son exploitation. — Né à Auschwitz en 1943 et mort en France en 1985. — Chambre à gaz et terrain de foot. — La banque(route) du Yad Vashem. — La transformation des morgues des crématoires d’Auschwitz-Birkenau. — Des actes de décès pour les juifs gazés ? — Jean-Claude Pressac et les archives de Moscou. — Le procès Irving vs. Lipstadt. — Hitler et le génocide des Arméniens. — Des cheminées qui fumaient jour et nuit. — Gazé à Treblinka et mort à Minsk. — Des déportés juifs de France retrouvés en Ukraine ? — Les fables des fosses de crémation et de la graisse humaine utilisée comme combustible. — Le journal du docteur Kremer. — Friedel, 9 ans : gazé mais revenu. —Des enfants rescapés d’Auschwitz. — Des actes de naissance pour les enfants nés à Auschwitz. Etc. • We know that Yad Vashem embarked on listing the names of 6 million Jews exterminated by the Germans; currently there are 3 million names, but, as we have seen in Dubitando, n° 3, the database is a hotchpotch: you can certainly find the names of Jews who unquestionably died in the course and because of their tragic deportation, but you can also find a large number of names of Jews who died in combat, died of old age or a natural death, or even Jews who survived the deportation (such as Henri Krasucki); finally, there is an incredible number of duplicates. In this way, Yad Vashem has probably increased the number of Jews who died because of their deportation by a factor of 2 or 3. • Since our last visit, Yad Vashem has uncovered and registered the names of the Berlin Jews (more than 52,000 names); however, they had previously entered the names of the German Jews which already included the names of the Berlin Jews; therefore, these 52,000 Jews have been counted at least twice in the database; those who had been deported from the Netherlands or from France (several thousands, including 500 who were from Palatinate [Pfalz] and the Land of Baden, when the evacuation of the Jews from these areas to Gurs was organized) have thus been counted up to three times and those deported to Lodz might have been counted four times; there are also (and this detail speaks volumes about the Jewish casualness with statistics) 157 Norwegian Jews who have simply been transited through Berlin; some 1250 unfortunates who chose to commit suicide rather than abandon their homes have not been forgotten, but that is understandable. Those who were deported to Theresienstadt and to destinies which we will examine later in this article, are also counted at least three times, because Yad Vashem had already registered the nearly 15,000 entries relating to this camp; nevertheless, some of them might be counted a fourth time if they were transferred through Auschwitz and died there, since Yad Vashem has additionally registered the names in the camp’s Death Books once more, of which, contrary to what has been feared, they only entered the names that sound Jewish. An example other than Berlin: In Dubitando, no. 4, we have seen that the father of the Paris historian Henri Minczeles, who died at Auschwitz, was listed four times in the database; he is now included a fifth time. Of course, Yad Vashem has also entered the testimonies of the relatives of the dead, which only inflates the numbers. Thus, we have to say that the 52,000 Berlin Jews were included three times on average. • Apropos testimonies: Yad Vashem is launching an urgent appeal because they seem to have difficulties getting beyond the 3 million “exterminated” Jews. It appears the appeal was heard by some: an Israeli woman testified in this way for 246 Dutch Jews with the designation “friend”, “close friend”, “family friend” or simply “acquaintance”; however, all of them were already included at least once in the database. This appeal to witnesses (who are the source of more than 50 % of the database entries, according to a survey) will only aggravate this inflation of numbers. The French Committee for Yad Vashem reminds you through our channel of the urgency and the need, for those of you who haven’t already done so, to fill in the testimonial documents concerning your exterminated family(ies), as well as any person, girl- or boyfriend(s), neighbour(s), that you remember. Submit your claims to our headquarters. 39 Boulevard Beaumarchais, 75003 Paris. • We have also seen it was a myth that the database contained evidence of gassings at Auschwitz. Thus, the children of the ghetto Lodz who were allegedly gassed at Auschwitz were found alive after the war: they were only transported through Auschwitz. But we can also find evidence that the gassing of Jews at Treblinka is another myth. Historians claim that almost all Jews deported to Treblinka were gassed, because there was no selection between those able to work and the unfit as at Auschwitz; the SS spared only the lives of a few to help them with their sinister work and then killed them at the end of the operation of the camp. Among the transports that were processed in this way, there were the transports from Theresienstadt; in this Czech village the Germans had ghettoized a large number of old Jews from various origins (German, Austrian, etc. ); the provisional Jewish policy of the Germans was then to move the Jews “farther east” until they were able to relocate them permanently outside Europe (to Madagascar, for example) and they had deported a large number of them to the Ukraine, Belarus and the Baltic countries via Auschwitz, Sobibor, Belzec and Treblinka. Thus, 10 convoys finally left Theresienstadt for Treblinka in 1942. In one of them was Siegmund Rothstein from Berlin, whose name is found in the Yad Vashem database. First, let me say that the name of this deportee from Berlin is entered three times in the database, for the reasons explained above. However, when the German entry mentions the death of Rothstein, it places it much further east, in Belarus—to be precise, in Minsk! As already mentioned, S. Rothstein is in fact no special case: many Berliners (in addition to elderly Jews from other parts of Germany) were deported to Theresienstadt and then from there to Treblinka, but for the German authorities none of those unable to work died at Treblinka and all of those who didn’t return died in Minsk or elsewhere. The deportation of S. Rothstein (and many others); in dashed lines, the segment hidden by historians. It is impossible not to see the evidence that those unable to work who were sent to Treblinka weren’t gassed but sent further east to Belarus (where, incidentally, many transports of Jews arrived directly from Germany and Austria, even from Theresienstadt). the gassing of Jews at Auschwitz and Treblinka is another myth. Hence the need for liberticidal laws. Or Henri Bulawko or Simone Veil, who have told us the same, but their names (and that of Madeleine, sister of Simone, also a survivor) have just been withdrawn from the database. However, the names of the majority of the survivors from France are still there. Dead deportees are often listed several times, like the unfortunate parents and the brother of Simone Veil (included twice), the father of Robert Badinter (included twice), the father of Serge Klarsfeld (included three times), the father of Henri Minczeles (included five times), etc. 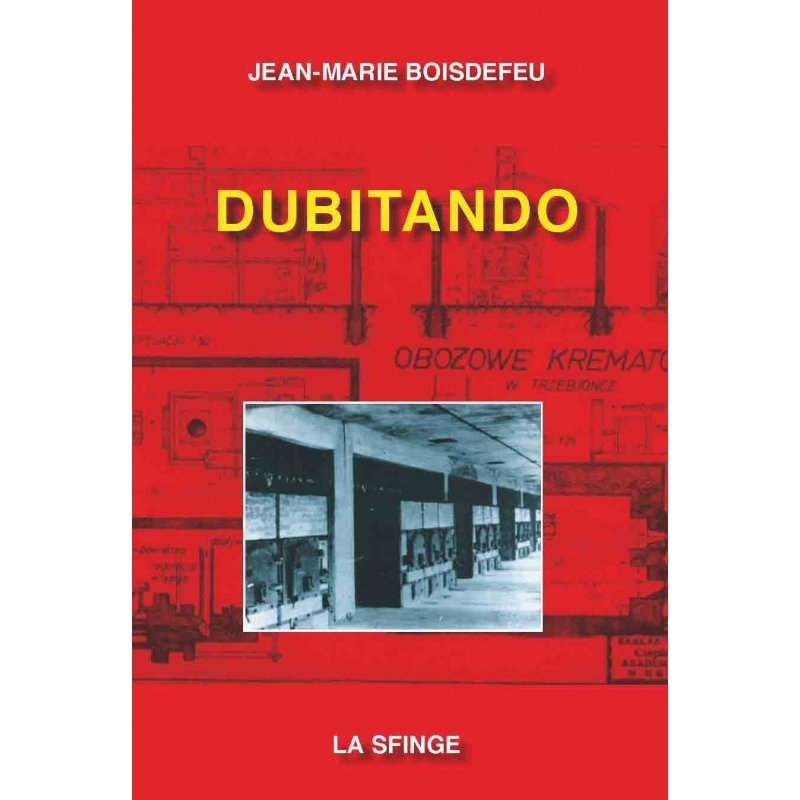 Jean-Marie Boisdefeu, Dubitando: Textes révisionnistes (2004–2008), La Sfinge, Rome, 2009, chapter XV, pp. 79–80, notes: Note that Szepel Minczles is included 4 times in the Yad Vashem database of the dead (based on the following sources: Mémorial by S. Klarsfeld / testimony of his son Roger in 1978 / testimony of his son Henri in 1978 / second testimony of the same Henri in 1999). Note that the average number now held by historians is 5 millions; hence, it would be necessary to stop quoting the 6 million figure.